One day apart a reader and a client asked where is the best place to keep the dishtowel and dish sponge. Alrighty then, here is my opportunity to sound off about the topic. Dish towels and sponges must be absolutely clean each time one is used. Because the average sponge can host 7 billion bacteria, (namely E. coli or Staphylococus aureus), you could be doing more harm than good during a counter wipe down. Follow the advice of cleaning experts and keep your sponges as sanitary and effective as possible. Get in the habit of disinfecting your cellulose sponge or dish cloth. 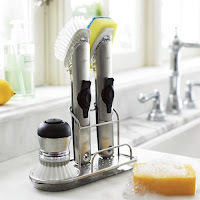 An article from RealSimple.com, “How to Keep Sponges Germ-Free: Sponge basics and tips for microbe-management”. gives advice on this subject. “A damp, dirty sponge encourages bacteria growth. But it’s not enough to squeeze out the dishwater, says Richard Sparacio, cofounder of MaidPro, a nationwide housecleaning service. Once the soapy water has been released, rinse the sponge under hot water. Then press out the water (wringing will damage the fibers) and place the sponge on a rack, not under the sink. Allow it to dry fully before the next use. A great tip, simply zap the sponge in the microwave for two minutes on high or run it through the dishwasher. Kim and Aggie, from the British TV series, “How Clean Is Your House?” recommended using a clean dish cloth soaked in hot, soapy water with a dash of bleach to keep them clean and bacteria free. Where do I store my Dish Sponge? 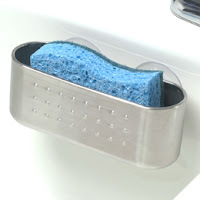 The best thing for sponges, available in plastic or chrome with suction cups allows the sponge to have a home right in the sink bowl. Tuck it away from view by attaching it at the front of the bowl (nearest you). The sponge can drip dry in the sink and no one will be the wiser that it’s there. The sponge should have a chance to dry between use to keep it clean and bacteria free. I toss my sponge at least once a week even though the recommendation is at least once a month. I detest sink tilt out trays because it is a dark dank place for microbes to incubate on your sponge. Don’t neglect the suction cups. Keep them clean by scrubbing them with hot water and dish washing liquid, or pop it in the dishwasher once a week. 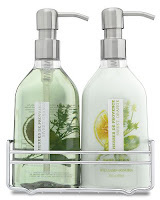 Since we are talking about sink organization, my favorite is from William Sonoma. I like their containers in these chrome containers. Very attractive. Although they need to make one for the dish washing liquid which sadly doesn’t fit in this grouping. 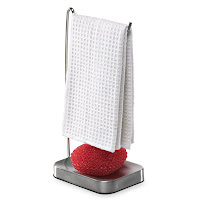 If you use both a dish cloth and a scrubbie sponge this is great for letting them dry out between use. Where do I store my dishtowel? I hang my working dishtowels on a tiered rack on the inside of my pantry door. They air dry and are out of site to keep my kitchen looking tidy. I use a clean dish towel everyday. One client even refuses to hang her towel. Tossing it in the laundry bag after every use she grabs for a fresh dish towel at every cooking session. And do not rehang a dirty towel, toss in the laundry bag and grab a fresh one. I recommend keeping freshly laundered dishtowels stay ready for work in a drawer near the sink. 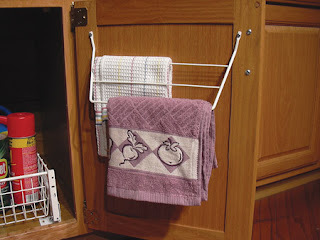 Use the tiered rack for keeping dishtowels and dish cloths out of site yet handy for work. This one is from Rev-A-Shelf # 563. The worst place to keep a dishtowel is hanging off the range handle, the dishwasher handle or refrigerator handle. It is sloppy and unsightly. Buy a stack of dishcloths and dishtowels and change them often. Before and after. Without the towels looks better. This client keeps her sink tidy by keeping her tiered towel rack behind the sink door. Cautionary note: do not hang wet dish rags near the door. The moisture and dark space is bad combination for bacteria growth and also moisture will ruin your cabinets. Lay your dish rag flat at the sink to air dry. Fold and hang dry towels in this space. An alternate method for storing the dish towel, not wet dish cloths. It is is more expensive and is planned with the design of the kitchen cabinet order. The problem may be using 9″ or 12″ of valuable base cabinet real estate may make the “towel bar” cabinet impractical in a small kitchen. An apron sink with the dish towel folded neatly over the sink is an alternate method. Not recommended on sink bases with a standard wood or painted false front. The moisture from the towel will ruin the stained or painted cabinet fronts. 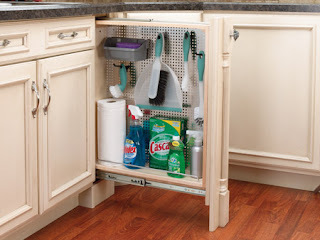 This Rev-A-Shelf Base organizer with a stainless steel panel is a favorite of mine. 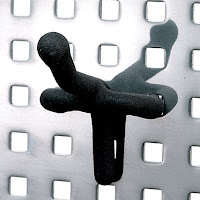 These rubber coated hooks come in various configurations and are great for storage. 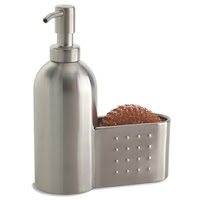 I would suggest the dish towel can be hung from a hook inside this stainless steel panel as well as extra paper towels, dish detergent, extra liquid soap, extra scrubbies. Rev-A-Shelf makes this product in 3 sizes. 3″, 6″ and 12″. I love this!